The Hon. Mrs Aileen Plunket, Luttrellstown Castle, Clonsilla, Co. Dublin, Ireland; Christie's, London, 27 September 1983, lot 508. William Augustus, duke of Cumberland, was the son of King George II, by his wife, Caroline, daughter of Johann Friedrich, Margrave of Brandenburg-Anspach. He entered the army shortly before the outbreak of the War of Austrian Succession, and between 1740-57 he served as Colonel of the Coldstream Guards, 1st Foot Guards, and of the 15th Dragoons. He was promoted in 1743 to Lieutenant-General and was wounded at the Battle of Dettingen in the same year. 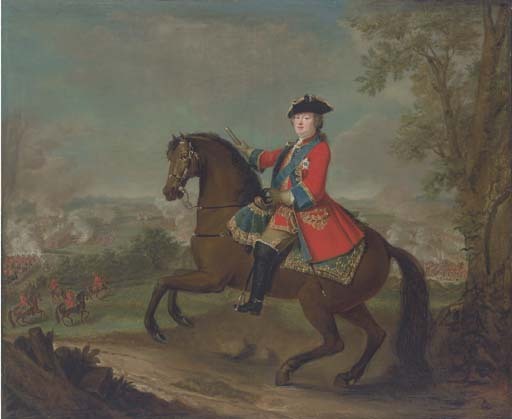 He became Captain-General of the army, 1744-45 and was in command at the battles of Fontenoy, where he was defeated by the French, and Culloden, shown in the background of the present work, where he successfully defeated the Jacobite rising. In the Seven Years War he signed a capitulation to the French, called the Convention of Kloster-Zeven, an act which led to his resignation of all military command. The background of the present painting shows the Battle of Culloden in 1746. Charles Edward Stuart's rebel Jacobite army on the left face Cumberland's troops across Drumossie Moor. It has been suggested that the moment depicted is when Lord George Murray led the right flank of the Jacobite regiments forward, only to be met by grape-shot, not only from the front but also from the right, where a side batter supported by the Campbells and Lord Loudon's Highlanders had out-flanked the Jacobites from behind a boundary wall of the Culloden estate. The notorious slaughter that ensued culminated in Cumberland's victory. David Morier was born at Bern, Switzerland. Nothing is known of his early career before 1743 when he was introduced to William Augustus, duke of Cumberland, by Sir Everard Fawkener, possibly in Germany where the duke was on campaign. His first notable painting was an equestrian portrait of George II (Royal Collection), with a view of the battle of Dettingen (27 June 1743) beyond, which was later engraved by Francis Simon Ravenet and published by the artist. Morier is principally known for small military equestrian portraits with battles or reviews in the background, including many of the duke of Cumberland and several of George II, and also for depictions of soldiers, detailing their uniform (principally in the Royal Collection and at Wilton House, Wiltshire). In 1746 he undertook a commission to commemorate the duke's victory against the Jacobites, The Battle of Culloden (Royal Collection). The present work is likely to have been undertaken during the same period. In 1747 Morier accompanied his patron to the Low Countries, painting Royal Artillery in the Netherlands and a series of sixty pictures of the allied troops under the duke's command (all of which are in The Royal Collection). In 1751 the first British uniform regulations were issued by royal warrant and Morier, made Limner to the duke with a salary of £100, embarked on further series, including the light dragoon regiments raised in 1759 and 1760. When the duke of Cumberland died in 1765, his second home, Cranbourn Lodge, Berkshire, housed 106 of these paintings and only works by Morier hung in the picture gallery. A founder member of the Society of Artists, Morier exhibited at its first show in 1760, and then in 1762, 1765, and 1768. In the mid-1760s he undertook an important commission for the earl of Pembroke, which included eight paintings of the 15th light dragoons. He also produced several small paintings for George III for 10 guineas apiece, but after June 1767 royal patronage ceased and he fell into financial difficulty from 1768 until he died at Clerkenwell, London, in early January 1770. He was buried on 8 January at St James's, Clerkenwell Green, at the expense of the Society of Artists. Luttrellstown Castle is considered one of the finest demesnes in Ireland. The history of the Luttrells begins with Sir Jeffrey Luttrell, a follower in Ireland of King John. The first concrete connection between the family and the castle is a Robert Luttrell died and was seized of the estate in 1436/7. The Irish Luttrells became one of the leading dynasties of the Pale but had a notorious reputation and when the property was bought by Luke White in 1800, he changed the name to the more prosaic 'Woodlands'. Luke White's fourth son was enobled as Baron Annaly in 1863 and the family continued to live at Luttrellstown until the early part of the 20th Century when it was let to various people before being sold to the Hon. Ernest Guinness in 1927. Ernest Guinness bought the estate for his daughter Aileen Plunket and it was due to her that much of the interior of the house was renovated in the 1950s. The original late 18th and early 19th Century rooms were restored and she collected much of the furniture and paintings, including the present work, which were later sold by Christie's at the Luttrellstown Castle sale in 1983.